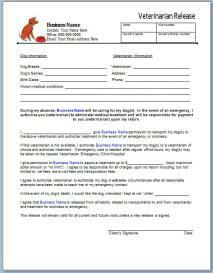 Your clients will fill out and sign the veterinarian release form which will give you permission to take their dog(s) to the vet if something should happen. It will state where their vet is located and allow you to use a different vet should that vet not be available. It also releases you from payment and transportation responsibility. The veterinarian release is very detailed to relinquish you from liability. This form will be sent in Word and PDF format. It is completely editable and will come with instructions on how to open the file as well as how to edit it (including adding a logo).